If you are a newcomer to the world of Avios, I generally recommend that you try Club Europe business class on short-haul redemptions from Heathrow or Gatwick. I know that this view is not universally shared! I think that is EASILY worth an extra 4,500 Avios and £7.50 of tax on the outbound flight, especially if you don’t have British Airways status. Coming back, it might not be such a good deal – you may or may not get fast track security and you may or may not find the lounge is good. Outbound, though, I definitely recommend it. Except …. if you are flying from London City. I originally wrote this article in response to an email from a reader who had spent his Avios on Club Europe from London City on a flight to Spain. Because Spain is further from London, the Club Europe premium is higher – 30,000 Avios per person return versus 15,000 Avios for Euro Traveller. Priority boarding – it exists in theory, but the high percentage of status card holders flying out of City means that virtually every passenger on peak business routes qualifies for it anyway! You DO get to sit at the front and you DO get better food. The food is by far the best part of the London City British Airways experience. As I wrote in this review, it is substantially better than what you get out of Heathrow, because there is no other point of difference between the two travel classes. On the other hand, Economy passengers still get free snacks and free drinks out of London City. The potential reason to redeem for Club Europe, if you don’t have unlimited Avios to spend, is if you need the additional Club Europe baggage allowance. So, in summary – I do recommend that you redeem in Club Europe for short haul redemptions if you can, especially outbound and especially if you don’t have BA status. Just not from London City …. unless there are no other seats available or you have a lot of luggage. On the shorter flights I wouldn’t avoid flying club Europe out of LCY if it meant getting the flight that I wanted. Same as any short haul when you have silver or above status. Disappointed in my recent LCY flights. Asked for my drink order then completely forgot to serve it, cold unsubstantial meals at dinner time when I was forced to fly CE due to ex-EU longhaul. Id pay more to sit in ET even on BA mainline. if you dont have priority security, i wouldn’t put my preference on LHR. nor if you’re from where it’s easier to go to LCY than LHR (depending on the destination). long queue, no snacks at LHR vs short(er) queues, some plane food at LCY. With status your threshold should shift towards the west. Confused. Title says don’t waste Avois redemption on CE but text says it’s a good idea except from LCY where it’s a better product? “Why you shouldn’t waste Avios on Club Europe redemptions from London City”. Where is your confusion? The title clearly says from London City. LCY is the code for London City airport. Arrived in LCY last night at 19:30. We were kept waiting inside the plane for 15 minutes after the door had been opened. The line for immigration was so long it was backing along the corridor to gate 5. LCY is no longer the joy it once was. Hardly a crisis, at other airports the taxi alone can be 15mins! I think what people miss is that it makes Economy redemptions even better value from City. Usually fares are more expensive from City, you get a snack and a drink, you only have one other person in your row, all for 4500 avios. Or am I missing something? Yes, I agree. Economy redemptions from LCY are great value and they are the main way I spend Avios. It helps that I live much closer to LCY than LHR, so this also saves me an hour’s travel in each direction. When it’s a route that flies from LHR or LGW as well as LCY, I’ve always found city airport prices to be competitive and sometimes cheaper. Rob – Priority check-in and boarding at City is for CE and Gold/ OneWorld Emerald only – Silvers and Bronzes get neither there. I’d agree City outbounds are a waste of money – only reason to do it is that it can be a very cheap source of tier points. Inbounds it’s worth looking into local airport set-ups. Gatwick departures has the biggest difference between CE/ status and non-status passenger experience. The business check-in hardly ever has queues and fast track security is very fast. Lounges are really good – a significant cut above LHR. The only downside is the layout of gates makes group boarding a bit of a mess. The way I see it is, why do you waste Avios on CE when you can fly economy from LCY? I think that depends on where you are coming from. We redeemed in CE from LCY and agree with all of your “what you don’t get”, but still didn’t regret it, because it was cheaper than an economy cash ticket and there were no economy redemptions available! I think Rob is talking about when you have a choice. If you have Silver or above when it comes to european trips the only reason to pick CE over ET is if it’s getting you cheap TP. I didn’t realise redemptions earned TP. You learn something new every day. Actually John, it wasn’t. It was a misunderstanding of TGLoyalty’s comment. They don’t! I presume the OP is meaning some cheap CE deals from LCY sometimes? Bilbao, Spain is actually zone 1. Bargain. That is useful… How did I not notice that already? Yeah, lounge niceties aside, it can be a Great a Tier poInt earner. Also at short notice it can mean the difference of paying circa £100 for a one way CE, versus Heathrow being x3 times the price. As for Avios redemption, useful for getting availability when Heathrow exhausted on that. I’d have worded the title more glass half full “LCY great fallback when Heathrow too expensive/no seats” rather than the glass half empty approach! Ive booked a Club Europe redemption from heathrow to prague in a few months time . I was assuming i would be flying out of T5 , but this BA flight actually goes out of T3 apparently. What are people recommendations for a BA lounge in T3 , i see we could use the Cathay Pacific Biz lounge ? If the flight is late enough to warrant it, try all 4! Qantas is nice environment but slow service for drinks, sometimes hard to find anyone serving, the downstairs restaurant hasn’t been open the last couple of times I’ve visited. Yep, T3 for Prague – fantastic lounge options – if you have time I’d go for Cathay Biz plus Qantas. AA generally very quiet but not great dining options. Wouldn’t bother going anywhere near the BA business one. I wish more flights left from T3 – the only hassle is when connecting from domestic you have to go through security again and in both directions you’ve got the airport bus to wait for. Yes we did Prague last week,and had fabulous food and champers on the Quantas lounge. Didn’t get time to visit CX tho, avoided the ba one like th plague. Only realised it was t3 on the m25 on the way. Almost got dropped at t5…panic over.. I actually really like CE from LCY and happily pay the extra Avios required for redemptions over ET. That said, the food is not as good as it was in comparison to LHR/LGW flights – I think it has dropped in standard whilst the LHR catering has significantly improved since they moved to Do&Co and got rid of those dreadful paninis. 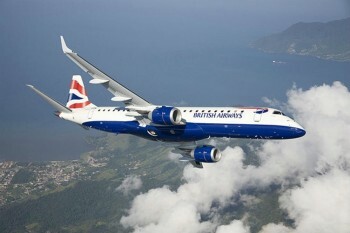 Personally I much prefer flying in the little Embraers over the A319/320/321s. And the staff are generally excellent. Taxiing/ disembarkation/ baggage/ connections are much faster. “Good value especially if you don’t have BA status”. More like unless you have status, in which case it’s a complete waste of money for the most part, no?